Enalapril requires a prescription from your veterinarian, and is sold per tablet/capsule. What is the most important information I should know about Enalapril: Enalapril is FDA approved for use in dogs only; however, it is a commonly accepted practice to use Enalapril in cats as well. Enalapril is available by prescription as 2.5mg, 5mg, 10mg and 20mg tablets. The usual dose in dogs is 0.25mg per pound once a day. The usual dose in cats is 0.1 to 0.25mg per pound once a day. The dose of Enalapril may require adjustment based on the animal¿s response to treatment. Enalapril is usually administered with furosemide and digoxin. Tell your veterinarian if your pet is pregnant or if you plan on breeding your pet. Enalapril could cause birth defects. Allow plenty of water for the pet to drink. If the pet becomes dehydrated, this can lead to very low blood pressure, electrolyte disorders, or kidney failure. What is Enalapril: Enalapril belongs to a group of drugs called angiotensin converting enzyme (ACE) inhibitors. Enalapril is used in dogs to treat congestive heart failure and high blood pressure. 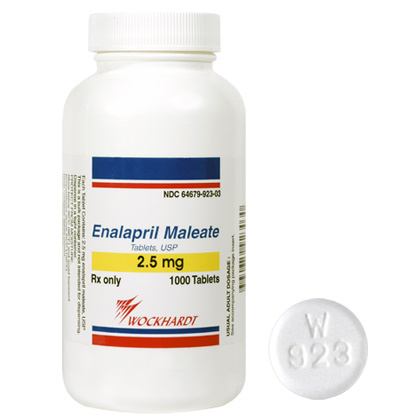 Enalapril may also be used for purposes other than those listed in this guide. How should this medication be given: Give Enalapril exactly as directed by your veterinarian. Do not give this medication in larger amounts, or take for longer than recommended by your veterinarian. Follow the directions on the prescription label. If you do not understand these directions, ask your pharmacist or veterinarian to explain them to you. Allow plenty of water for the pet to drink. Enalapril may be given with or without food. Periodic liver and kidney function testing may be required by your veterinarian. Store Enalapril at room temperature away from moisture and heat. What happens if I miss a dose: Give the missed dose as soon as you remember. However, if it is almost time for the next regularly scheduled dose, skip the missed dose and give the next one as directed. Do not give a double dose of this medication. What are the possible side effects of Enalapril: If any of the following serious side effects occur, stop using this Enalapril and seek emergency veterinary medical attention; an allergic reaction (swelling of the lips, face, or tongue; difficulty breathing; closing of the throat; or hives). Call your veterinarian if your pet develops any of these serious side effects; fainting; urinating more or less than usual, or not at all; fever, chills; easy bruising, or bleeding; swelling, rapid weight gain. Less serious side effects may be more likely to occur. Continue to use Enalapril, but speak to your veterinarian if your pet experiences; cough; loss of appetite; dizziness, drowsiness; sleep problems; dry mouth; nausea, vomiting, diarrhea; mild itching or skin rash. Side effects other than those listed here may also occur. Talk to your veterinarian about any side effect that seems unusual or bothersome to the animal. What other drugs will affect Enalapril: Tell your veterinarian if your pet is being given; a potassium supplement; aspirin or other NSAIDs such as etodolac (EtoGesic), carprofen (Rimadyl), deracoxib (Deramaxx), and others; a diuretic. Talk to your veterinarian or pharmacist before giving any prescription or over the counter medications, including vitamins, minerals, and herbal products. Where can I get more information: Your pharmacist has additional information about Enalapril for health professionals that you may read. Call your veterinarian for medical advice about any side effects to your pet. You may report side effects to the FDA at 1-800-FDA-1088.